Helen Walmsley Johnson’s brave and unflinching memoir on coercive control, LOOK WHAT YOU MADE ME DO, is published today by Macmillan in hardback and ebook. Helen’s frank account of life in an abusive relationship is a valuable read that opens up an important conversation about what coercive control is, and the fight to overcome it. For more than two years, BBC Radio 4’s The Archers ran a disturbing storyline centred on Helen Tichener’s abuse at the hands of her husband Rob. Not the kind of abuse that leaves a bruise, but the sort of coercive control that breaks your spirit and makes it almost impossible to walk away. As she listened to the unfolding story, Helen Walmsley-Johnson was forced to confront her own agonising past. Helen’s first husband controlled her life, from the people she saw to what was in her bank account. He alienated her from friends and family and even from their three daughters. Eventually, he threw her out and she painfully began to rebuild her life. Then, divorced and in her early forties, she met Franc. Kind, charming, considerate Franc. For ten years she would be in his thrall, even when he too was telling her what to wear, what to eat, even what to think. LOOK WHAT YOU MADE ME DO is Helen’s candid and utterly gripping memoir of how she was trapped by a smiling abuser, not once but twice. It is a vital guide to recognising, understanding and surviving this sinister form of abuse and its often terrible legacy. It is also an inspirational account of how one woman found the courage to walk away. You can read extracts from LOOK WHAT YOU MADE ME DO in both YOU magazine, and The Times Magazine. Yesterday, Helen appeared on the Victoria Derbyshire show, talking openly about the abuse she endured in her past relationships. She will be attending the Southbank Centre’s Women of the World festival tomorrow, joining a panel to discuss the how shame is used to control women. In June, she will be speaking at the Stoke Newington Literary Festival. Helen Walmsley-Johnson was the author of the Guardian’s popular ‘The Vintage Years’ column, on older women and style. She worked for the Daily Telegraph, before joining the Guardian as Alan Rusbridger’s PA for seven years. Her book about middle-age, THE INVISIBLE WOMAN, was published to great acclaim in 2015. She lives in Rutland. 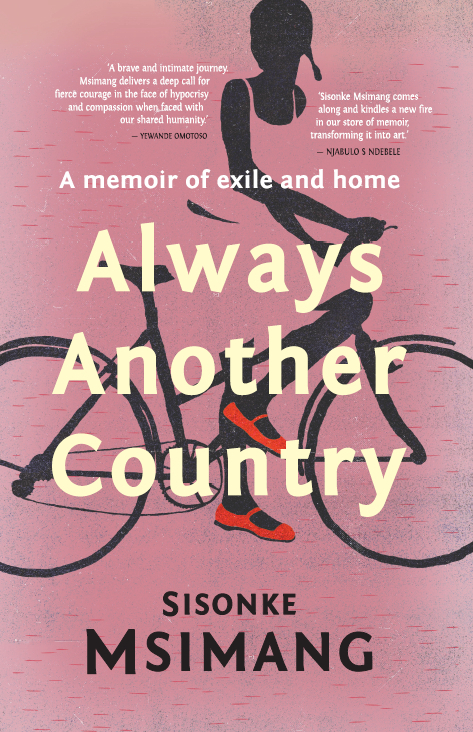 From her peripatetic childhood in a family of political exiles – from Zambia to Kenya to Canada and beyond – Sisonke tracks formative moments in her personal and political life, including the euphoria at return to the new South Africa, the disillusionment at new political elites, and the ugly face of racism and xenophobia. But while well-known political figures appear in these pages, ALWAYS ANOTHER COUNTRY is also an intimate story, a testament to family bonds and sisterhood. Sisonke Msimang’s international childhood prepared her to be a global citizen and an eloquent warrior for social justice, while her experience as a journalist and incisive political analyst makes her vision wider than the personal – but she also has a fiction writer’s gift for vivid characterisation and dialogue, and a voice that is warm, honest and wise. ALWAYS ANOTHER COUNTRY is moving and relevant, sometimes as much generous manifesto as memoir, following the journey of a girl becoming a woman, a feminist, a campaigner, a mother and a writer. Sisonke Msimang lives in Perth, Australia, where she is Programme Director for the Centre for Stories, a social enterprise organisation, but she travels regularly to the US, South Africa and internationally. The child of prominent political exiles during South Africa’s apartheid era, she was born in Swaziland and raised in Zambia, Kenya and Canada, before going to the US as an undergraduate. Her family returned to South Africa after the release of Nelson Mandela and the unbanning of liberation movements in the early 1990s. She has a BA from Macalester College, Minnesota, a Master’s Degree in Political Science from the University of Cape Town, is a Yale World Fellow, an Aspen New Voices Fellow, and was Ruth First Fellow at the University of Witwatersrand in Johannesburg. She regularly contributes to publications like The Guardian, The Daily Maverick, The Conversation, the Huffington Post and The New York Times. Sisonke contributed a chapter to THE TIES THAT BIND: FRIENDSHIP AND RACE IN SOUTH AFRICA (University of Toronto Press). She recently gave an extremely popular TED Talk and narrated a story at The Moth event in New York. Video: A Pragmatic Idealist: The Moth in Washington D.C.
Lyndall Gordon’s richly-layered memoir DIVIDED LIVES: DREAMS OF A MOTHER AND DAUGHTER is published by Virago on 19 June. The award-winning biographer turns her insightful writer’s eye to her own life and her relationship to her mother – an extraordinary and intensely realised tale of loyalty and division; breakdown and recovery; migration and home. 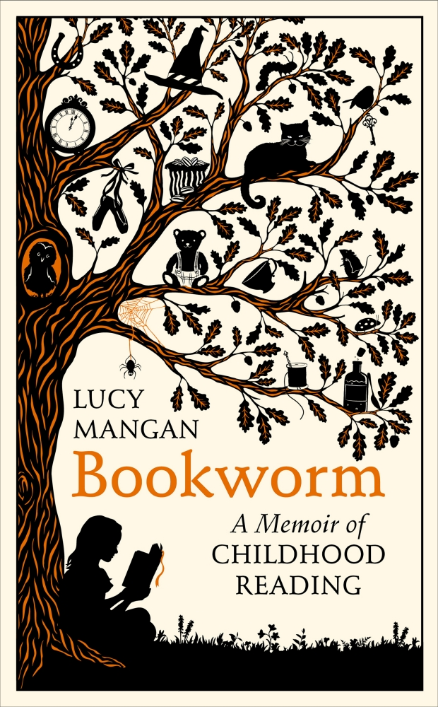 The book has already received excellent reviews, with Susie Orbach in the Observer calling Lyndall ‘a biographer with soul, she reaches into the hearts of those she brings alive for us’. 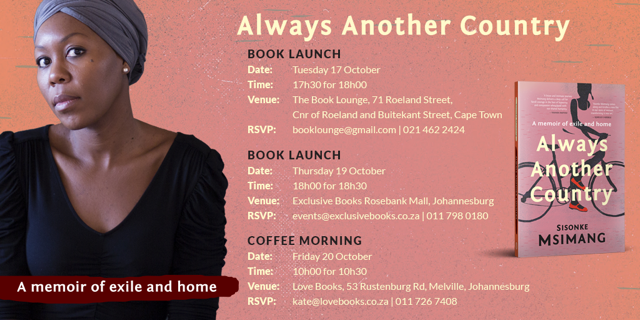 There are several chances for readers to catch her around the UK talking about the book in coming months. On 9 July, Lyndall will be at the Telegraph Way With Words Festival at Dartington Hall. She will be talking about Mothers and Daughters, in the Barn at 5pm. Tickets cost £5 and can be booked online. On 26 July, she is reading at the Women Writers’ Salon with Maggie Gee, author of VIRGINIA WOOLF IN MANHATTAN, at the Upper Wimpole Street Literary Salon. The event starts at 7 with readings beginning at 7:30. 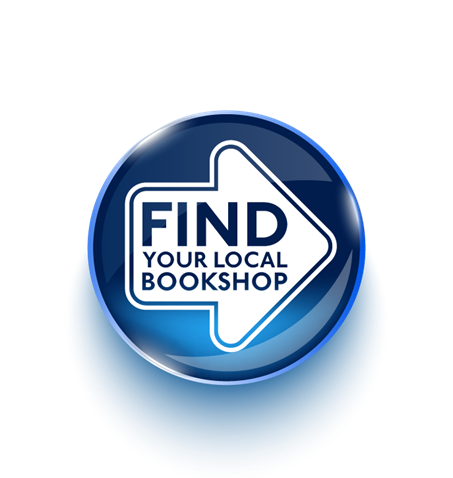 Later this year, Lyndall will be appearing at Ilkley literary festival, among others. Lyndall Gordon was born in 1941 in Cape Town, to a mother whose mysterious illness confined her for years to life indoors. Lyndall was her carer, her “secret sharer”, a child who grew to know life through books, story-telling and her mother's own writings. Moving and beautiful, DIVIDED LIVES is a poetic memoir about the pain and joy of being a daughter, that is also an intriguing social history and feminist text, rich in literary reference. Lyndall Gordon's earlier memoir SHARED LIVES, about her group of young friends growing to womanhood in 1950s Cape Town, is now also available in ebook for the first time.